Why don’t I like this: The texture is very thick and leaves a visible white cast on the skin, and takes a while to absorb. It also turns my skin oily and there is a strong scent I find unpleasant to my nose. I tried my best to like it but the scent and texture got the better of me. I also find it pricey for a product I dislike, so I’m afraid this was one I just couldn’t bring myself to like. I’d run out of eye makeup remover (yes, I use separate makeup removers for eyes and face before cleansing) and rummaging around my “store” yielded this one from Kate, which is a sub-brand of Kanebo Cosmetics. I can’t remember how much this retailed for but it isn’t terribly pricey and I can’t remember when I bought it either. It’s a usual bi-facil style makeup remover with oil that you shake up to mix before using to remove makeup. Why don’t I like this: I didn’t think this eye makeup remover to be very efficient especially to remove waterproof eyeliner. It takes quite a lot of work to get this to remove the Bobbi Brown gel liner pencil. I don’t wear mascara much anymore but when I do, it doesn’t do a good job of removing. I was using Maybelline before and I liked it. I like the L’Oreal one too. This one? I’ll finish it but I’ll never repurchase. 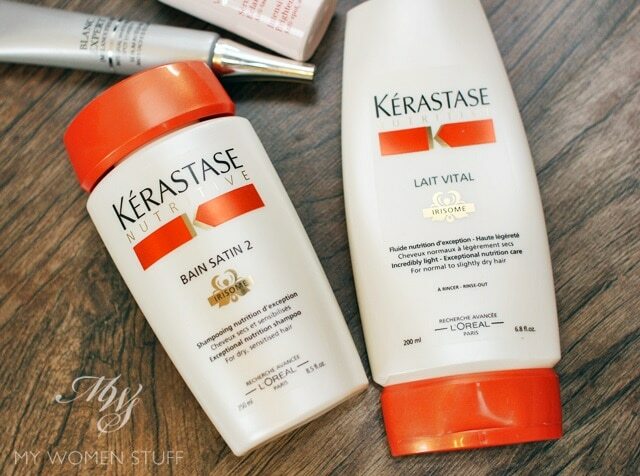 Kérastase makes pretty good hair care products and if your wallet allows it and it suits your hair (like skin, not every hair care product suits everyone) then it’s pretty good. When my hair was much longer than it is now, I loved keeping a tub of Oleo Relax mask on standby in the shower to use occasionally because it literally relaxes my hair and makes it soft, shiny and manageable all the time. The Nutritive Irisome is a new range to provide long lasting nutrition to hair by infusing dry hair with nutrition and keeping it nourished and protected and looking good. They both smell pleasant. Not too strong, nor too chemical and I liked how neither the shampoo nor the conditioner felt too slippery with silicones. I don’t like that overly slippery feel any more in hair products. Yet, despite being about halfway through both products, I finally decided I don’t quite like this range. Why don’t I like this: For some strange reason, despite everything that this Nutritive range claims to do, my hair actually started feeling drier and drier with regular use. I don’t have a sensitive scalp and my hair, while a little dry is fairly normal for non-treated hair. It didn’t feel like straw, but I noticed it was losing its lustre. I broke off for a spell, tried out Sachajuan (which I do like!) and my hair felt better. Came back to this when my Sachajuan samples ran out and it’s just “like that lah!” I will finish it because it’s there and my hair doesn’t feel like straw, but I don’t like this enough to recommend it nor to repurchase the way I have Oleo Relax. This one’s a new formulation from Lancome and while I had a decent enough result after trying a version from years ago, it was surprising that I derived no benefit from this product this time. I’ve given it 2 months and I’m at the stage where I’m quite unfazed by having pigmentation, and where I think my existing skincare routine which is devoid of whitening products, is doing a good enough job at keeping things under control. It’s not to say I’m against using whitening products, but all I’d say is that they are no longer on my radar nor on my dresser. Why don’t I like this: It absorbs into skin quickly but I didn’t quite like the texture nor the strong scent. I couldn’t bring myself to be diligent enough about using it because whitening serums no longer fit in my routine and I just didn’t like it. It’s one of those things, and although I kept to a minimum 1 month use, I saw little to no results and 2 months use didn’t yield any better. Clarins reformulates their White Plus every year or every other year it seems. Last year they’d done away with their signature Sea Lily Extract and the formula now not only brightens but makes skin more luminous. While I think Clarins does well for my skin with their hydration range that comes in the blue packaging, my skin has never taken very well to the White Plus range which is why I chose to not try this one but gave in when pressed. I’ve tried White Plus over the years with different incarnations and the result has always been the same – I find it too drying. It’s not unique to Clarins. I find most whitening products drying with very few exceptions which I attribute to the formula. Why don’t I like this: I thought the serum was ok. It absorbed well enough into skin and although I initially didn’t like it I found that what I really did not like was the Brightening Hydrating Emulsion which now comes with SPF20, for the reason that it is not hydrating at all for my drier skin and it doesn’t absorb into my skin, and causes my sunscreen and foundation to ball up. It’s very strange because the previous formula was fine by me. I had no complaints. This time, the emulsion refused to absorb and when I layered my sunscreen over (Shiseido Perfect UV has a very light texture) it balls up and then I get worried that I wasn’t getting the due protection the sunscreen should give me. I even used other sunscreens over and it caused them to ball up too (Kanebo Impress IC and Kose Sekkisei). As I’m not one to mess with my sunscreen, the answer was simple, this product had to go. 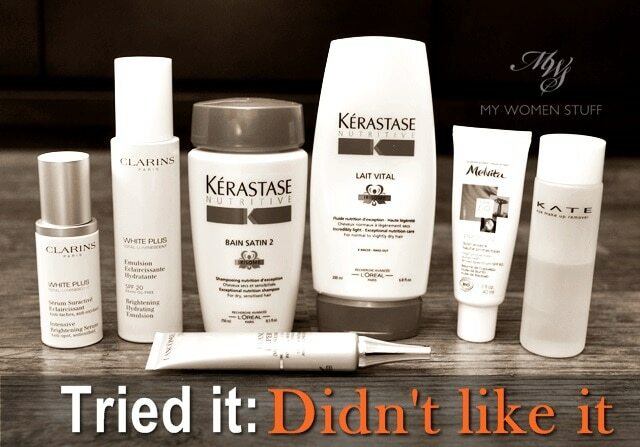 Have you used any of the products here and have a similar or different opinion? Please feel free to share your view. Just because I don’t like them doesn’t mean it’s bad. It just means I don’t like them 😛 I’m always happy to hear alternative views, especially if you happen to love any one of them. Disclosure : Featured products were press samples for consideration. Our commitment is to honesty and fairness. For posting guidelines please read the disclaimer. PREVIOUS POST: Your Say: Do you wear or change your makeup according to the seasons? The only product I have used here was the emulsion from Clarins. 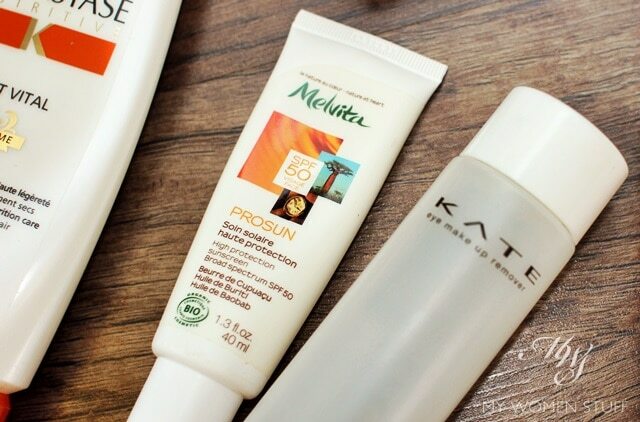 I didnt like the one with SPF 20 but I prefer the one without. Like you, the formula is kinda weird and gives a greasy look on my face. My makeup and sunblock doesnt go well with it either. So yeah, lets just hope we are not the only 2 nutties who dont like it. LoL! Clarins White Plus Total Luminescent Intensive Brightening Serum and Brightening Hydrating Emulsion. The serum dried my skin, and the emulsion gave me breakout and tiny bumps. Ugh. I dislike both. my hair has always been quite a fan of kerastase products 😀 but recently also loving the loccitane shampoo + condition for damaged hair 😀 it smells really yum! which other product would you suggest for hyper pigmentation? I personally find it drying Parita but then I find all whitening skincare drying so I’m perhaps not your best benchmark 🙂 If you can get some samples, it’s worth trying. I don’t use whitening products anymore so I’m probably not the best person to ask. But when I did use, I found the Clinique Even Better Serum helped lighten some pigmentation as well as the Shiseido White Lucent serum. I’m afraid those are the only 2 that really stood out for me. I haven’t paid any attention to whitening since then. I am having a lot of troubles finding a whitening serum that isn’t drying as well. I end up layering it under other serums and moisturizers to alleviate the dryness, which can end up being too much. I used that Kerastase shampoo before and it was great for me, but I also actually switched to Sachajuan recently on recommendation of my readers, and I can say that the Sachajuan products are significantly better! You should give the Rahua shampoos a spin as well, see if you like it! 🙂 I know I do! You’re right Shasha, Sachajuan is pretty impressive and the price point is roughly the same. I love the smell of Sachajuan shampoos. It’s so different! 🙂 Thanks for the Rahua rec. I’ll keep a look out for it! 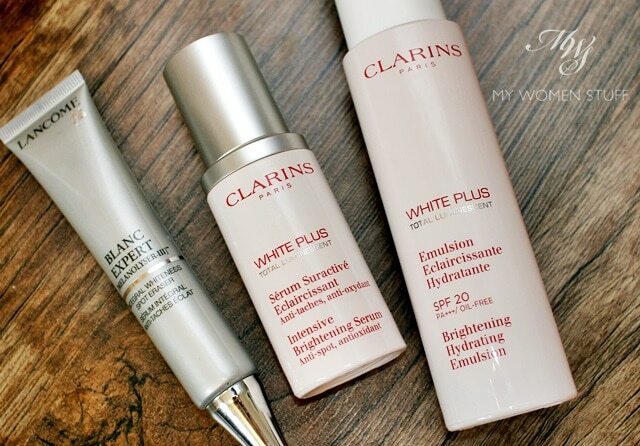 I have not used any of the products mentioned but I have really wanted to use Clarins White Plus Total Luminescent Intensive Brightening Serum. I don’t think I want to waste RM300 on this product after this review. LOL. I am currently using the Gentle Exfoliator Brightening Toner and so far so good. Hey Pais, I’ve tried the mask and pre-shampoo treatment from the Kerastase range, and they both work well. I have the same issue with that slippery silicone feeling, but I think this range is fine. So sorry to hear it’s not working well for you! I know that problem with some hair products though, that’s why I prefer to test even a shampoo out for quite sometime before I form an opinion. Kerastase (Orange range): Doesn’t work on my hair esp. if I swim regularly. But their Purple range was good. Clarins: A bit too rich for my combo skin. So am using it with other products. Melvita: It was OK but the smell requires a bit use to it. It did make my skin brighter. Unfortunately I have skin color type: Olive & pinkish under the sun. Hehehe.. never used Kate’s skincare before, only owned some makeup set. Haven’t tried it. When I had longer hair, I loved the Oleo Relax too! I love the smell as well which is weird considering I don’t like very strongly scented products. Oh and yes Elixir Ultime. One of the best hair oils I’ve ever used. I could not remember the Lancome cream I used before. Because it smelled so strongly, I finished one pot and then found love in Origins. Bye bye Lancome ever since. HAHA.